Bar & Restaurant at Ramada01924 274200work RestaurantThe hotel has a fully stocked Air-conditioned Bar and Relaxing Lounge with Large Screen Television showing live sporting events. Free High Speed Wireless Internet Access is available in the Bar and Lounge for guests wishing to have small informal meetings. In the evening we offer a range of Home Cooked and Modern Cuisine accompanied by our fine wines from around the world. The hotel has a fully stocked Air-conditioned Bar and Relaxing Lounge with Large Screen Television showing live sporting events. Free High Speed Wireless Internet Access is available in the Bar and Lounge for guests wishing to have small informal meetings. 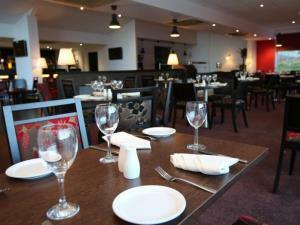 With our large free car park and easy access it makes for an ideal location an informal dinner. Leave the city centre on the A638 (Dewsbury Road). Follow signs for the M1 motorway. Continue forward. Hotel is located on the right. Go around the roundabout 4th exit and turn left. Hotel is immediately on the right. Leave the M1 at Jnc 40. Follow signs for Wakefield City Centre (A638). Turn left at the 1st set of lights. Hotel is immediately on the right and can be seen from the road.